Everything in the world has a price, including lack of action. So feel free to deem the income, that you would have earned, but didn’t gain, to be your loss. Indeed, if you figure in damage, that estimate will shake you to the core. But Cart2Cart cares about customers’ peace of mind, well-being and feels compelled to show you the right way for getting better result. Entrepreneurs who are standing on the verge of starting their new eCommerce venture all have the same issue to face with at some point in time: which shopping platform should I choose to run my online business? When coming to that major crossroads, our guidebook could be hugely beneficial - we’re all together here no need for secrecy. Go on to find out which blind spots nopCommerce covers-up, what ace Magento has got in the hole and how OpenCart can get you on its side. We’ll teach you, how to get rid of adverse factors, that impede progress and makes you stay where you stood from the very beginning. Welcome to our nopCommerce vs Magento vs OpenCart cards-up ultimate comparison, but be on alert, a lot of essential eBusiness secrets await you, wield this power wisely. First of all, let’s make the priorities clear. For a retailer, the immediate and primary task is to know and understand impeccably what’s going on in the buyers’ mind. That awareness will help you to compare nopCommerce vs Magento vs OpenCart, determine crucial goals, requirements and demands of the business, which should be satisfied first and foremost. If you realise what the eStore is supposed to look like, in what way your goods have to be offered to clients and how much you need to invest in the shop to make it profitable, you’ll be clear about the platform, perfectly fitted personally for you. Ready with the request? Fine, it’s time to consider applicants. eCommerce platforms are generally available in one of two modes: easy-to-use SaaS solutions or feature-rich open-source software, including our three counterparts. Belonging to the last type, nopCommerce download is available for free and accessible to anyone with the skills to install it. Officially launched in 2008, today the platform boasts of 2,5+ million downloads and hosts 50,000+ online stores. 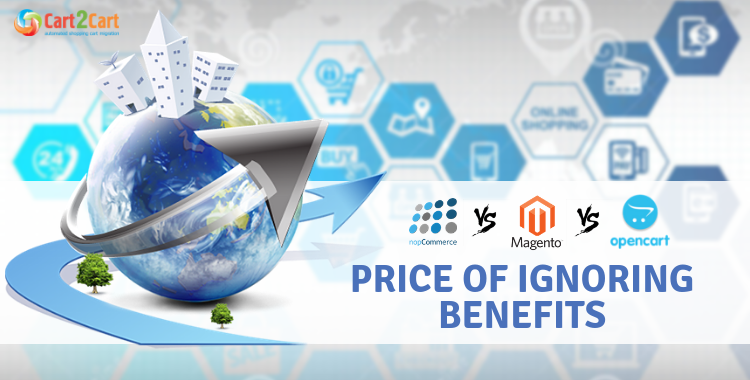 Since its foundation in 2007, at present Magento has become one of the leaders in the eCommerce market. This trendy self-hosted platform counts 240,000 active merchants and facilitates over $100 billion in gross merchandise volume annually. 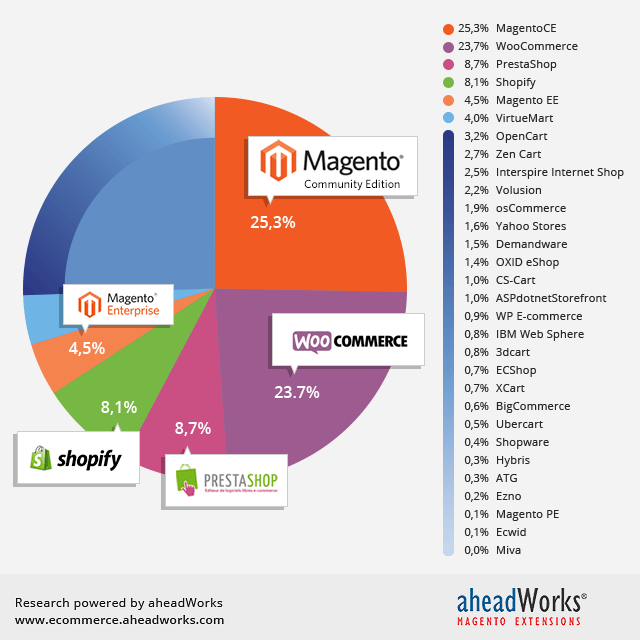 Its impressive feature set, robustness and flexibility keep Magento at the top of market share rates quite a while. It’s an excellent choice for retailers, who are ready to implement advanced technology best and have enough resources for that purpose. OpenCart is available for free download, upgrade and use as well. It was established in 2012, and now the platform hosts more than 380,000 live websites. This solution works on PHP basis so any merchant, who has a solid background in the programming language would benefit from it. But you will hardly take advantage of the ability to have a fully functional site with inventory management, email notification, product descriptions, product pages, and much more without having to know how to code this or that. In terms of taking the lead in this nopCommerce vs Magento vs OpenCart match, well, again, it indeed comes down to things like your budget, selling requirements, and whether or not you’re going to perform migration for opening up new horizons. Move on to our step-by-step comparison for revealing behind-the-scenes aspects. Speaking of nopCommerce, its customer service is lacking, but what can you expect from a free product? Well, don’t be surprised if your request or bug will be with no replies weeks later. At the same time, crowdsourcing has not been repealed: the platform supplies users with a supportive community forum and robust documentation portal. Good news, it won’t cost you an arm and a leg - this information has public access and is free of charge to everybody. If your projects have taught deadlines, require dedicated help or cannot be solved with submitted options, nopCommerce team is at your service for a 3-month or 1-year period and guarantee the response within 24 hours. For an additional fee, of course. But it’s always up to you: to make do with what you have for free, or purchase premium support plans, which are far from being cheap. Being open-source platform, Magento cannot boast of support team existence as well. There is no email, phone help or live chat for Community users. Otherwise, for people, using Enterprise edition, the cart offers a dedicated account manager to help you whatever you ask for assistance. You’ll also be equipped with a variety of technical documentation, forum, sales portal, help centre, blog, user guide for a marketplace, contact information and etc. Actually, such an amount of data will be sufficient for business running. You can also enrol in Magento’s training courses (this is an absolute must-do if you plan to become a Magento expert). These courses cost between $0 to $3500. And...nothing new. OpenCart support is also limited to blogs and forums. The platform’s strong side is, like with any other open-source panel, highly active community and popularity. This panel promotes third-party developers on their official webpage, and you can locate someone to avoid complexities (at a price, in case you were wondering), by filtered searching. For example, you may be okay with working with a remote developer, but many people would rather have someone in their own country. You can also submit a web ticket or call the OpenCart office in Hong Kong. If you do, you might end up talking to the founder, Daniel Kerr; OpenCart is still a relatively small business. OpenCart has also introduced support plans that are worth a look. You can choose between two options: a one-time fix (starting from $99) or a $99/month premium support plan, which has a minimum commitment of three months. User forums, video tutorials, blogs and bug tracker are always at your service as well. We dare say you’re underestimating what’s the word “pricing” doing here anyway? But don’t kid yourself. “Free” is a tricky term when it comes to open-source software, and everything has its cost (especially something truly valuable). Let’s stop believing in fairy tales and put our faith in something a little more real. You’re able to download and own nopCommerce without cost, but it’s the full list of options you have. Considering serious, profitable business, you should keep this in mind: investment is something inevitable. Besides, make sure you have enough to pay for web hosting, themes, add-ons, an SSL certificate, and the cost of any custom development you can’t do yourself. In addition, if you didn’t get it already, you’re gonna have to buy some Microsoft products to use in conjunction with nopCommerce. 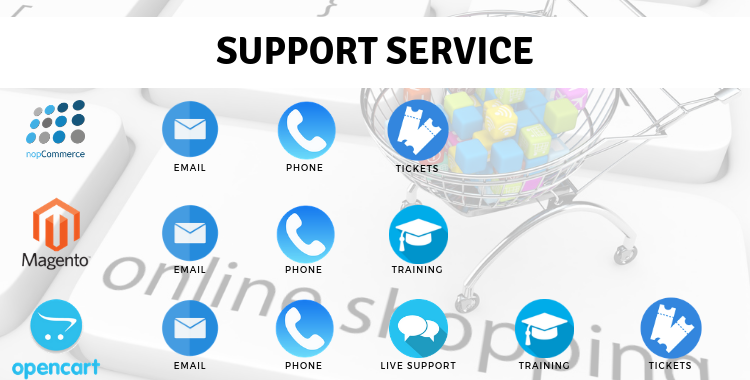 If you require notable help applying nopCommerce, you can spring for a support plan, which can be very pricey. As for add-ons, for instance, one of the popular and employed “CUSTOM PRICE PER CUSTOMER” costs $246. This tool empowers you to override the price of a product for a particular client. With this plugin, you can generate a price list for each buyer with the chance to import and export the goods to excel. "Custom Price Per Customer" adds new features for the management of prices and never excluding the core characteristics of NopCommerce. When it comes to value for money, Magento pricing has something really precious to offer, but it’s not free to implement for some reasons. Firstly, it’s a flexible, robust, multifunctional system in the background, and this expects it often takes even experienced Magento developers time to get how to accomplish what you require them to do. If you want to go for the Enterprise Edition, which includes support directly from the platform, you are looking at around $15,000 per year. Do not forget about payment for web hosting, domain names, add-ons, an SSL certificate, and payment processing as well. Due to the complexity and scalable design, you pretty much need to host a Magento store on its own dedicated server. In other words, it’s an additional expense to get things right, and an extra online monthly cost to boot. And one more time exactly the same game: yes, the good news - OpenCart is completely available to download, upgrade and use (it’s brightening up), but that doesn’t mean you’ll run your eStore free of any charge. The security and hosting is your overall responsibility, so basic expenses include web hosting, a domain name, and an SSL certificate. For creating a unique and exclusive look for your online shop, you would have to care for an extra fee. So when it comes to designing you’ll also have to spend a significant amount in the form of extensions, themes and templates. If you’d like to make eStore alive without downloading anything, there are two free OpenCart demo trials available. One shows you what the storefront looks like, while the other gives you access to the admin. OpenCart has recently presented a new, cloud-based version of their software. Pricing for this upgrade is based on the quantity of stores merchants own and the amount of storage they demand. Your additional costs will also include hosting plan (price starts from $5 / month if you’re on a budget, the quality host will cost you more), domain name (around $10 / year or so), expense of good design/template, or any additional modules/extensions that you want to have in your online store (those tend to cost $100 on average). Some of the advanced OpenCart extensions, which may develop your business and improve it significantly, will require a pretty penny to get. To be blunt, if you’re far from being a technical user, and don’t like to care much about techie stuff and spend some time mastering the software, those platforms were not designed for you. None of them doesn’t suggest the easiest styling of the shop for clients. Open source software will help you to hit the jackpot if you know CSS, but this is a tough challenge for beginners. If you have limited tech knowledge, you might consider investing in a web developer to help you through the rough spots. If you use the best part of nopCommerce - it's open source - and make customizations without going so far as to write plugins for it, the upgrade process is PAINFUL. You have to reapply each one, post upgrade. Above all, developers complain that when new versions of the software are presented, it’s hard to make all your customisations work with the platform again. You may have to reapply specific modifications manually. Going with Magento, you may keep calm: as a starting point for beginners, this platform is a user-friendly solution for those, who don’t have access to coding talent or programming experience to build a unique shop off their own back. The admin area is designed to be convenient for those without extensive knowledge or experience, so you should find it easy to piece together the basics of your online store yourself. As for the last counterpart, its renewed OpenCart dashboard may be considered clearly organised and perfectly adequate. A lot of basic functions for running and launching the eStore are available from the Admin Panel. This feature simplifies merchants’ task to the limit: they can focus main attention on marketing goals and be quiet concerning development aims. Since all previous categories cannot give you a clear picture of an outspoken leader, don’t give up, listed below features will make up your mind. Pay attention, as this information can change your priorities. First of all, we have to say, that it’s totally up to you which platform to choose. But based on the eCommerce platforms comparison results, Cart2Cart can give you some advice. Undoubtedly, nopCommerce has its advantages and strong sides, while at the same time there is a room for improvement. Today the digital market has a lot of forward-looking and fast-growing solutions, which were designed to meet your demands and resolve problems before you think about them. Considering Magento or OpenCart as robust, powerful and reliable nopCommerce alternatives? You’ve definitely come to the right place. Cart2Cart will migrate your existing store from one platform to another accurately, swiftly and securely. Our team sure knows how to breathe life into the business, that seems to be hopeless and loss-making. Start Free Demo to dispel doubts and make a move for success!